It’s the setting of the world’s greatest love story, but Verona has more to offer than just Romeo and Juliet. While romance, conflict and passion shaped the city, it’s the Roman, medieval and Renaissance architects that earned it UNESCO World Heritage status. Verona’s remarkably well-preserved architecture is crowned by its magnificent amphitheatre, the Arena, which has remained intact for two centuries. 25,000 spectators still take to its marble seats during Verona’s summer opera festival. Known as piccolo Roma (little Rome), Verona’s narrow streets are a rich collection of beautiful buildings and baroque facades. With its stunning historic monuments, wide variety of restaurants and fabulous shopping, Verona has all the ingredients for the perfect weekend break. Roman gates, sections of the original city wall and other ruins are found at every turn. The elegant, three-storey Porta rises wonderfully above Corso Porta Borsari, the city’s best shopping street. Still, it’s Romeo and Juliet who have left the greatest mark. 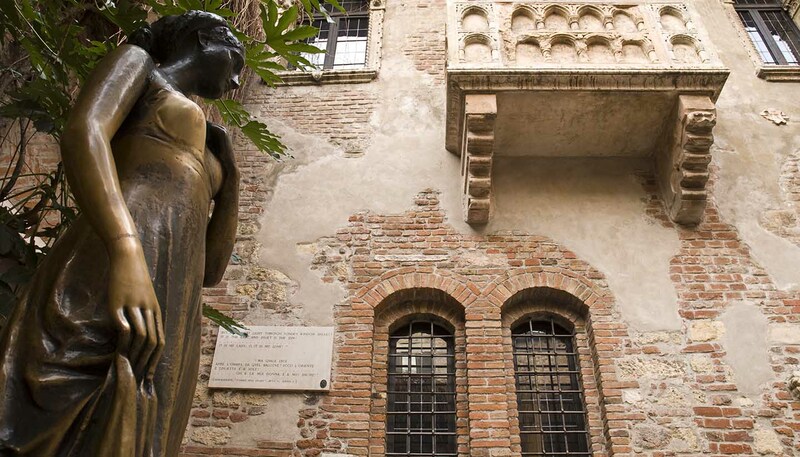 Discover the amour and agony of devotion at the 14th-century balcony of Casa di Giulietta, where lovers graffiti hopeful pleas on the courtyard walls. Romeo’s banishment took place in the magnificent Cortile del Mercato Vecchio, while the tale’s epilogue leads visitors to Juliet’s tomb in the crypt of San Francisco al Corso monastery. Verona has more than its fair share of beautiful churches. With elegant rounded arches and soft yellow stone, the magnificent Basilica of San Zeno Maggiore is regarded as one of the finest Romanesque buildings in the world. Rising above the whole city is Castelvecchio, the ancient castle which overlooks the surrounding Valpolicella and Soave wine districts. But little beats striding along the Via Mazzoni to peek into its boutique shops and designer chains, or visiting the buzzing market stalls on Piazza delle Erbe. Situated in the affluent and culturally rich Veneto region of north eastern Italy, Verona is within a few hours train ride or car journey from Venice, Vicenza and Padua, so works well as a base from which to explore this particularly beautiful and historic part of the country.